The Tasmanian Museum and Art Gallery (TMAG) is celebrating all things science this August, with an action-packed month of activities and exhibitions. Firstly, tomorrow (Thursday 2 August) sees the opening of the Antarctic Photography Exhibition, part of the Australian Antarctic Festival, in TMAG’s Bond Store Basement. 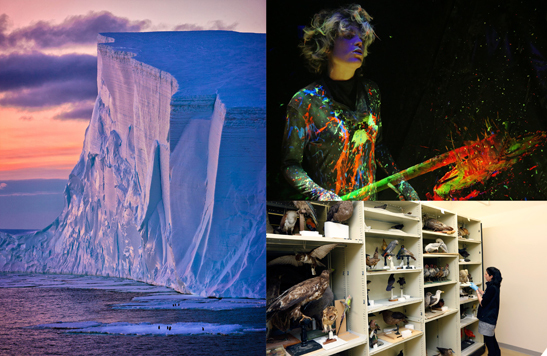 Until 19 August, visitors will be able to see stunning photographs of the icy continent which are the finalists in the festival’s Antarctic Photography Competition, and also vote on the people’s choice winner. From next week, National Science Week gets underway across Australia and TMAG is taking part in several events to celebrate. On Friday 10 and Saturday 11 August, TMAG will be open late to host the second edition of the pop-up science bar for adults, BeakerStreet@TMAG. Highlights of the free-entry event are set to be a visit from ABC presenter Dr Karl Kruszelnicki and a talk on probability by MONA founder David Walsh. Visitors will also be able to listen to a range of talks from guest speakers, meet roving scientists, dance to live music, check out the finalists in the Science Photography Prize and enjoy plenty of Tasmanian food and wine. TMAG staff will also once again join in the fun at the Festival of Bright Ideas at Princes Wharf No. 1 on Hobart's waterfront on Friday 17 and Saturday 18 August. While the sessions on Friday are for pre-booked school groups, festival-goers will be able to visit TMAG’s stand during Saturday’s free public open day and see how science comes alive. And finally, TMAG’s own scientists will be offering some fascinating ‘Into the Vaults’ behind-the-scenes tours at our Rosny Collections and Research Facility and the Tasmanian Herbarium. Visitors can sign up for a free tour of the Tasmanian Herbarium in Sandy Bay on Tuesday 14 August, and a free tour of the Rosny Collections and Research Facility on Monday 20 August. For more information about all these events, please visit the Events page. (Left) Chris Wilson’s first prize winner in the Antarctic Photography Competition in 2016, Iceberg with Penguins. (Top right) BeakerStreet@TMAG promotional image, courtesy Crow’s Nest Media. (Bottom right) Behind the scenes at TMAG’s Rosny Collections and Research Facility.